Today, according to the American Library Association, is National Gaming Day at your Library. As a person who has grown up gaming, I see the confusion in some parents’ eyes as they try to determine what games are right for their children. Your kid already knows what they want – but just because it’s a game doesn’t necessarily mean you should cave in, especially if you’re the type of parent that pays close attention to the movies your child watches or music they listen to. Why should video games be any different? So today, I’ll be at my local library presenting, for parents who wish to attend, A Parent’s Guide to Gaming. I will be discussing ESRB ratings, as well as how the individual consoles handle their parental controls. For those unable to attend (the extreme majority of the people who view this website), I’ve prepared a few links that might help you. Below are videos from the Entertainment Software Association of Canada – now these videos are a little old, but the majority of the information is still the same. I wish I had the ability to record today’s demonstrations, which will all show case the latest revisions of the Xbox 360, PlayStation 3, and Wii. Since you can’t attend, below the videos are also step-by-step guides from the manufacturer’s themselves, describing in detail how to manage the Parental Controls of each console, with their latest updates. After recently winning a free copy of this game in a Twitter giveaway, I thought it would be nice to give it a quick review! 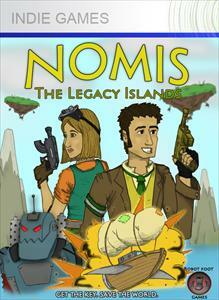 Nomis: Legacy Islands itself is a ton of fun, having a lot of that platforming fun that has disappeared from console games in recent years. As one reviewer already stated, the main character is very much a “Nathan Drake” wanna be, which is apt: I found the game to feel quite a bit like the poor man’s shadow complex – another game featuring another “Nathan Drake” like character (and, in that case, voiced by the same actor that plays Drake!). The side scroller and platformer mechanics are fast and fluid. The game has an excellent pace to it, which helps when the levels seem to sprawl in a ‘not-quite-linear’ fashion. While all roads may lead to Rome, you feel like you have a choice in how to get there! The ability to angle your shots with the right analog stick makes the game automatically stand out from other shooters… it suddenly feels more like Contra III on the Super Nintendo, rather than a classic Contra rip-off. I hadn’t played the game before it’s first ‘overhaul’ – but graphically it’s very well done. Treated with a lot of care so that nothng disappears into the background or is not seen before it attacks you. Some of the ‘backdrop’ girders make me think I have to go around, from time to time, but that’s a matter of learning the level design on my end. The sound is well done, and the little extras like robots crying out when they kill you, or your character making comments at the end of a level add a great deal to the game. My biggest complaints come directly from the combat system. If you do not hold down the right trigger when you fire, your shots disappear from the screen. You can’t fire repeatedly as you approach a target, because you must wait for the first shot to hit them! The first boss battle also got very frustrating – if you ran out of ammunition, he was practically impossible to get to. I went to the in-game store to buy some ‘extra lives’ during this battle, but even after they ran out, I just kept respawning. Is there a mechanic where you’re supposed to have unlimited lives during a boss battle that wasn’t mentioned? Was this a bug? I may never know. The tutorial mentions how the Stealth does not work against bosses, however it certainly aided me in getting by certain parts. Tiny other things, like typos (“then” instead of “than”) were evident, but as someone with a degree in English, proof-reading is a curse, sometimes! From reading other reviews, it seems that the game has seen some enhancements since it first launched, and with a few more, this game will be undeniably fun. For $3, there’s absolutely no reason not to pick this game up, it will bring back a lot of the fun that you haven’t had since your last run through Contra! At the very least, give this Xbox Live Indie Game’s free demo a shot! 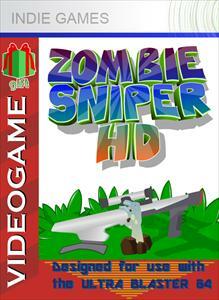 For a buck, Zombie Sniper HD is one of your better options of the Zombie games on Xbox Live Indie Games. 80 Microsoft points gets you three game types: an Arcade Mode, where you simply just shoot as many zombies in the head as you can within a certain time limit. A Challenge Mode, which is similar to Arcade Mode except that it has a classic shooting gallery feel – enemies walk by in pre-determined rows and paterns – still, you have a target number of kills and a time limit. Then there is “Story Mode” – in which you protecting unwitting civilians (see: zombie bait) from becoming zombie lunch. To accomplish any of these tasks, you take your sniper rifle in hand, and looking down the scope, just start doing what you do with zombies: turning their heads into piñata party favors and watch all of the fun leak out! You have a targeting reticle on the screen, which you scroll left, right, up, and down with. To zoom in, pull the left trigger, to fire pull the right trigger. And that’s where the problem lies… that’s the entire game. While the game rewards you for multi-kills, “Nitro kills,” and Killing Sprees, there just isn’t enough going on. If you’ve watched the trailer on the top of this page, you’ve seen the entire game. Zombie Sniper HD itself, in the Arcade Mode instructional screen, the voice over seems to think this game type is a fool proof formula for addictive gaming, claiming you’ll never get tired of shooting zombies in the head. Unfortunately, there’s not much truth to that. The game seems bug free, the sounds are good, and the HD sprites are cartoon-like by design, but very good looking. All animations are fluid, whether it’s the shambling of the zombies or panning of your crosshair. My biggest visual complaint is that, in some cases, that black aiming reticle disappears into the background; having the option to choose your color from a palette of more visible colors (yellow, white, cyan, green, etc…) would be a nice touch. However, the game really loses it’s luster quickly, and in the end is a great time waster while you wit for your pizza rolls to come out of the microwave. For a dollar, like I said, it’s not going to break the bank, and it does give some variety. I believe a mode that is timed, but has no target number of zombies to kill (3 minutes to beat your own high score, for example) would have been an invaluable addition to the game. But as far as the overall “fun” the game provides as it stands? It’s a good thing it’s only 80 MS Points. After some “sit down time” with Avatar Paintball, I’ve got to say that it’s a great starting place. The game has obviously been treated with more care than many other Indie Games out there. A lot of work went in to making what is a genuinely good game, though a little more public feedback and play testing I’m sure would have lead to the resolution of my biggest complaints. In Avatar Paintball, we are treated to an Xbox Live Indie Game with multiplayer online supper through Xbox Live, and a Leaderboard. This is among the most advanced XBLIG’s I’ve played. And while it may not have quite the graphcis of other games out there, even other indie games, but it’s not always about looks. The game itself is fast paced enough to keep you entertained – you don’t have to wait 30 seconds to respawn everytime you’re “painted.” The many powerups in the game, including super speed, invisibility, teleportation and more, all make the game quite interesting. You could be chasing after someone who is leading you right in to a trap. Some graphical glitches bother me from time to time – fences in the game are only a pixel thick: meaning that, at the right angles, fences don’t even appear on your screen. While most of the game has a cartoony feel, it is a perfect environment for your avatars to play, with many buildings sporting familiar names of other Xbox Live Indie Games from the same developer. This is kind of funnym but the self promotion gets shameless when you press buttons that to find out what they do, and the demo of the game prompts you to buy it every five seconds. Some things, like some of the shrubbery near the buildings, looks out of place and poorly texture mapped, but that may be a graphical complaint not many others will notice. The game is not without its faults, however. The over the shoulder, 3rd person view is abhorrent for aiming. You’ll go through half of your ammo hopper each time you encounter an enemy, because there is no targeting reticle. It’s a good thing ammo is readily available throughout the map, but perhaps stocking more ammo would be easier. 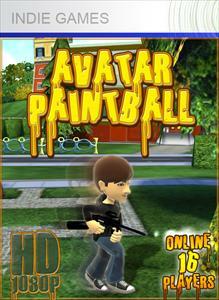 Avatar Paintball offers upgrades, but they are only unlockable by getting many points built up over a long “career” (so to speak). The more multiplayer games, or single player training sessions you go through, the more points you get to unlock better guns – but the point values for those guns are so high that most players will never get to them. If some players do, the players that haven’t, aren’t likely to stand much of a chance against the more advanced players, either. I’m guessing skill-based match making wasn’t a concern when this game started using Xbox Live’s multiplayer feature. Finally, the lack of a jump does make me feel a little bit stagnant. While the map is big, there’s only one of them, and at least a little bit of “verticle” may have made the game more interesting. Auto-Aim could solve the problem of looking up or down, it could be relatively straight forward levels of “verticle” – but an ability to jump would come in handy – not just when you back yourself into a corner, but when you see an enemy you want to get to. A future revision may cure some of these problems, and frankly at the $3 price point, I want just a little more from my indie games. But it’s an excellent start and I hope to see more solid work from DigitalDNA, especially when the demo is shamelessly begging for your Microsoft Points. The game, itself, I would give a 4.5/10 – but the fun level still gets at least a 6, because you may just want to have a little fun wasting time some nights, and Avatar Paintball may just be a good way to do that. While I hate to be cheap about it, the two previous XBLARatings reviewers both hit the nail on the head when it comes to World War Toon, and you may see me referencing some of the things they had already talked about! 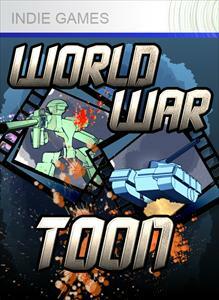 I had seen the name of “World War Toon” and was interested, but I had not yet seen anything about the game the game. After finally having a chance to sit down with it, I could not be more thrilled to play this game. Protip: when starting the game: use the quick start. Otherwise, be prepared to spend a large chunk of time just determing where all of your troops will begin. While that does stay true to the board game style, I have to admit it got very old – and I think the AI bot placements should go a little faster. In some cases an AI player will rotate the globe painfully slowly. Once they find what they’re looking for, however, the AI players fly through their progressions, knowing exactly what they want to accomplish. There is no beneficial tutorial mode, other than the basic “rock, paper, scissors” which troop-type is best suited for battle against which. It would help if the game explained or offered tips when placing new troops between rounds. The game seems to rely heavily on prior experience of board game players. Fluid animation of the interface, the simple and straight forward design of the combat dice being rolled, and the joy of zooming in and out on troops makes this game “not much to look at” and “eye candy” almost simultaneously. The game has no music to speak of, and lacks much in the ways of animated combat or even sound effects of battle… but what it lacks, it makes up for in the same way board games do. The action is almost never ending, can go for hours on end, and will undoubtedly hook you and your friends in to extremely long battles. I say World War Toon needs to be a full Xbox Live Arcade game with Xbox Live support – I want online play, with maps of different sizes (20 minute games would be nice for LIVE Support), an ability to sort of ‘save and resume’ would be ideal for the long campaigns, even if multiplayer. There is so much potential for this game I really hope the developers continue to work the idea out some more and have a full 800MSPoint offering some day in the future! Good luck to them. I enjoy the game, and I hope many others will, too. I was genuinely excited to try this game as soon as I saw the title. I enjoy BlackJack well enough, but maybe I’m just not familiar with the gambling scene to know what was going on. 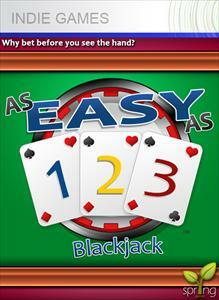 I gave Easy as 1, 2, 3 Blackjack an honest hour and a half and it made very little sense to me. I had a friend play it and as he started to catch on, he thought it was making sense, but when I asked him the questions that I ran up against during the game, he couldn’t answer them either. Primarly, it seemed as though you were always placing a bet on a hand that hadn’t been played. I could bet $300 and win $25, but the next hand’s ante was $300, when my chances weren’t nearly as good. Like I said, it may just be my own lack of understanding of the betting system, and other players may be having a blast betting on your choice of 3 different BlackJack hands. The game concept is unique enough, but even for my friend who thought he understood what was going on, the game quickly got stale. Here’s hoping someone out there finds what they’re looking for in this game, but unfortunately, I didn’t enjoy it much at all. 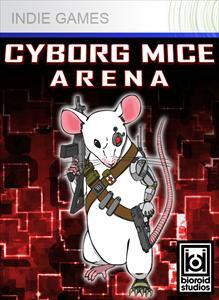 Let me right out of the gate say that I’m giving Cyborg Mice Arena a seven out of ten because it is fast paced addictive FUN. Consider it a more comedic version of your favorite twin stick shooters (Geometry Wars, Robotoron 2084, etc…). I first played the game for thirty minutes, and thought “well, I’ve seen enough.” A few days later, something told me I wasn’t ready to write a review for it, so I sat and played it a little more. It was then that I really got sucked in to the “I don’t want to set the controller down!” pace of the game. Enemies kept coming, wave after wave in the arena. Unfortunately, and this is what frustrated, even though the game rewarded me with 35 waves completed before I died and $39,000 in cash that I could use to unlock more weapons and cybernetic upgrades for my mouse, I was unable to comprehend the process of unlocking levels and game types! I simply could not unlock anything new and exciting. But just because that is my own mental limitation or inability to correctly read a menu, doesn’t mean this game’s score should suffer from it. The action is great, the 3/4 overhead Isometric view angle gives you much more to look at and appreciate the work that the developer put in to this game. The menu includes some hilarious backstory, excellent control customization (something missing from many twin stick games), and an interactive “art book.” The art book shows just how much care and creativity the developer put in to this game. I have not had anyone over and thought to play this game, but I look forward to an extremely hectic night of local multiplayer in the near future! 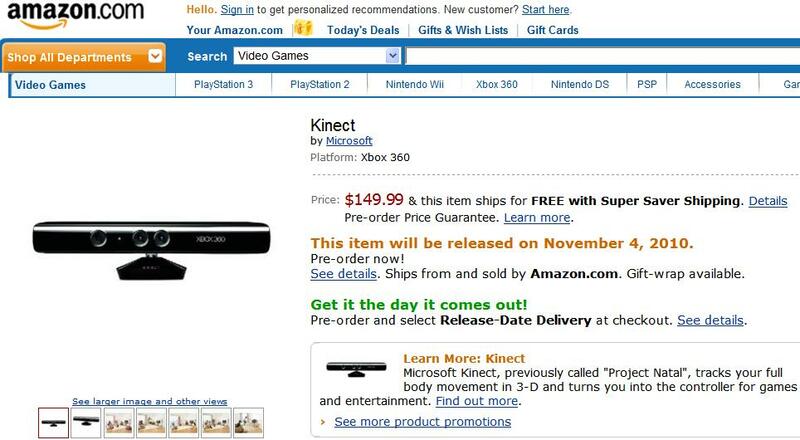 Xbox 360 "S" is the official name! During the big E3 event, Microsoft kept calling this new slimmed down Xbox 360 “The New Xbox 360” – but they stopped short of calling the “slim” or “small” or “lite” or anything! 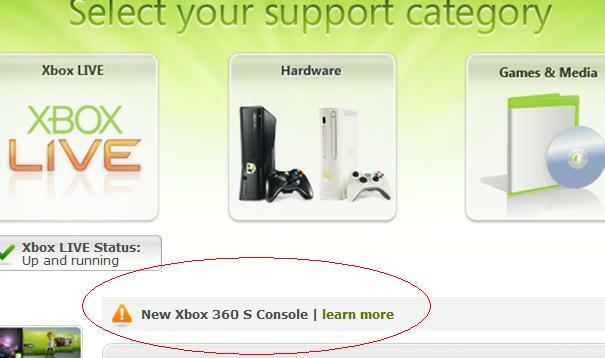 For those still wondering, the back of the box does, indeed, call the new Xbox 360 the Xbox 360 S. Not only that, but the support section of the Xbox.com website now officially totes the Xbox 360 S title. So if anyone out there was still confused, we do have a real name for the latest iteration of the console. Posted in Gaming, XboxTagged xbox 360Leave a Comment on Xbox 360 "S" is the official name!